Paris St-Germain need only one point from their final two games to win the French title after second-placed Lyon were easily beaten by struggling Caen. PSG went six points clear of Lyon on Friday night with two games left following a 6-0 thrashing of Guingamp. And Lyon failed to keep the pressure on as Nicolas Benezet scored twice late in the first half, the second goal a good burst into the box and a powerful shot. Sloan Privat sealed it late on as Caen moved five points above the drop zone. Laurent Blanc's PSG, who are aiming for a third consecutive title, are looking to become the first team to win all four domestic trophies in France. They won the Champions Trophy - the country's Community Shield - at the start of the season and the French League Cup. PSG face mid-table second tier side Auxerre in the French Cup final on Saturday, 30 May. Now the beaten Champions League quarter-finalists need only one point against seventh-placed Montpellier or 17th-placed Reims to win their fifth domestic title. Match ends, Caen 3, Lyon 0. Second Half ends, Caen 3, Lyon 0. Sloan Privat (Caen) wins a free kick in the defensive half. Attempt blocked. Herve Bazile (Caen) left footed shot from the left side of the box is blocked. Assisted by Julien Féret. Foul by Mohamed Yattara (Lyon). Damien Da Silva (Caen) wins a free kick in the defensive half. Attempt saved. Herve Bazile (Caen) left footed shot from the left side of the box is saved in the centre of the goal. Assisted by Sloan Privat. Goal! 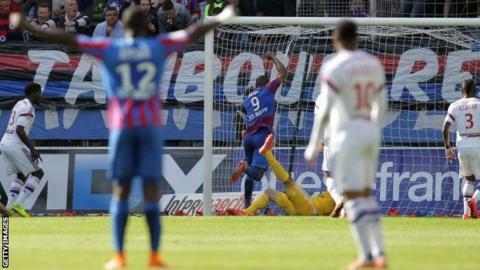 Caen 3, Lyon 0. Sloan Privat (Caen) left footed shot from the centre of the box to the centre of the goal. Assisted by Thomas Lemar. Offside, Caen. Julien Féret tries a through ball, but Sloan Privat is caught offside. Attempt missed. Sloan Privat (Caen) left footed shot from very close range is too high. Assisted by Thomas Lemar with a cross following a set piece situation. N'Golo Kanté (Caen) wins a free kick on the left wing. Substitution, Caen. Thomas Lemar replaces Nicolas Benezet. Nicolas Seube (Caen) wins a free kick in the defensive half. Attempt saved. N'Golo Kanté (Caen) right footed shot from a difficult angle on the left is saved in the centre of the goal. Assisted by Herve Bazile with a through ball. Substitution, Lyon. Steed Malbranque replaces Bakary Koné. Attempt saved. Sloan Privat (Caen) left footed shot from more than 35 yards is saved in the top left corner. Assisted by Nicolas Seube. Corner, Lyon. Conceded by Rémy Vercoutre. Attempt saved. Mohamed Yattara (Lyon) right footed shot from the centre of the box is saved in the centre of the goal. Assisted by Alexandre Lacazette with a through ball. Substitution, Caen. Julien Féret replaces Lenny Nangis. Offside, Lyon. Alexandre Lacazette tries a through ball, but Nabil Fekir is caught offside. Attempt saved. Nabil Fekir (Lyon) left footed shot from the left side of the box is saved in the top centre of the goal. Assisted by Clément Grenier. Attempt missed. Herve Bazile (Caen) left footed shot from more than 40 yards on the left wing misses to the right. Assisted by Nicolas Benezet. Alexandre Lacazette (Lyon) is shown the yellow card for a bad foul. Corner, Lyon. Conceded by Emmanuel Imorou. Substitution, Lyon. Mohamed Yattara replaces Jordan Ferri. Attempt missed. Jordan Ferri (Lyon) right footed shot from outside the box is too high. Assisted by Maxime Gonalons. Offside, Lyon. Alexandre Lacazette tries a through ball, but Mouhamadou Dabo is caught offside. Attempt saved. Nabil Fekir (Lyon) left footed shot from outside the box is saved in the centre of the goal. Assisted by Jordan Ferri. Attempt saved. Sloan Privat (Caen) left footed shot from the centre of the box is saved in the centre of the goal. Assisted by Nicolas Benezet.